"Who am I?" wonders Shark Baby. When his "mermaid's purse" egg case is torn loose in a storm, he finds himself on a journey through different ocean habitats: kelp forests, coral reefs, and seagrass meadows. He learns what kind of shark he isn't, but not what kind he is. He needs to find the “mermaid” to learn where he belongs, but the ocean is big and full of dangers. Will he find out who he is—and what he can do—in time? I remember finding mermaid's purse egg cases on the beach in Virginia Beach several years ago. The kids and I were so intrigued by them, wondering what they were. Fortunately we were able to learn more about them at the Aquarium near by. 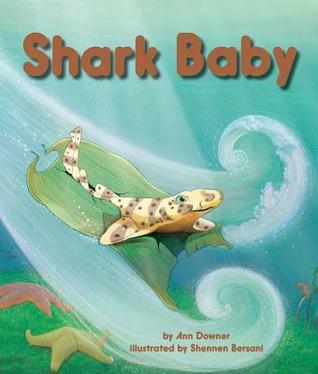 Such fun to now have a book where the shark baby is in a mermaids purse, trying to figure out where he belongs. Learn about ocean habitats, types of sharks, styles of egg cases and more. Much more than just a picture book, this book will get your interest up and running full speed ahead to learn more about the creatures of the ocean! Looking at the Teacher Activities you can learn about invertebrates and vertebrates, a basic science start for your scientists. printable animal cards representing the illustrations in the story including great game suggestions, adaptation and more. Great colorful illustrations by Shennen Bersani, you will enjoy the many animals of the ocean as she brings out the character in each one!